Todays outfit was inspired by the one and only Kylie Jenner, most of you guessed Khloe when I posted a selfie on my instagram … and I totally see why "My Hair" color. Anyways back to Kylie she wore two very similar looks back to back last month and I was actually one of the few who really liked the look, only makes me wish I had my dark hair again. I found this shirt (wore as a dress with shorts under of course) from the mens section at Wal-Mart a few days after she wore her looks but I was waiting on some leather over the knee boots … but when I received these from Missguided I decided to wear them for this look instead. Only forgot to add a cute scarf but hope you like my take on the #KylieSwag . Great look and I have to go with yours. 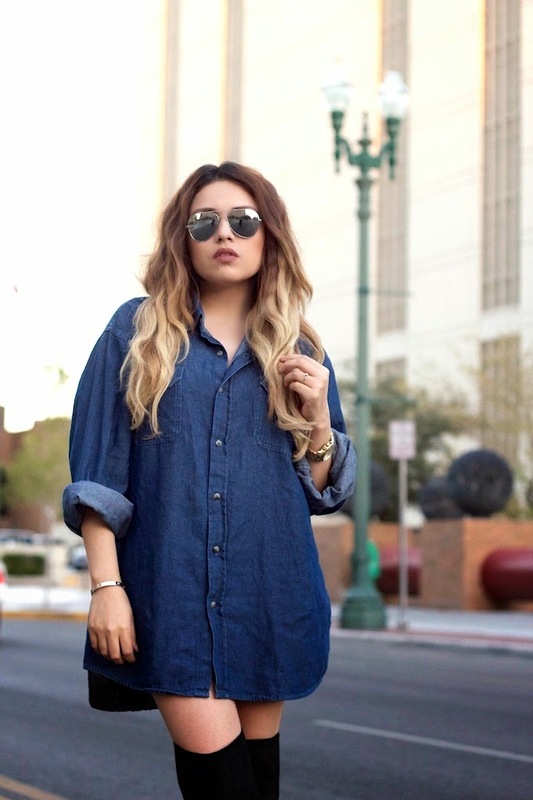 I love how the short is still oversized, but it is the perfect fit for you. On Kylie it is obvious that it is 10x's her size. ;) Also great boots too! Love this! Your boots are gorgeous!